Having kids is truly a joy and parenting is indeed, a joyful art. The little ones’ brains, habits and behaviour are in constant making and this provides an excellent opportunity for parents to introduce different activities to their tiny ones in a playful and exciting way so that they develop a lifelong love for them. One such activity (and probably the most important one) is reading. We all have probably grown up listening to stories from our parents or grandparents during our childhood. It often brings a smile on our faces thinking of those joyous times when the sunset would bring in a spark of excitement, in anticipation of the approaching bedtime when the words of some enthralling story would make way into our ears. Having a routine can be pretty boring but ask any successful person in any field, it is this boring routine which is the secret of his / her success. It is the ability to do something again and again, and get better at it which leads to greatness. 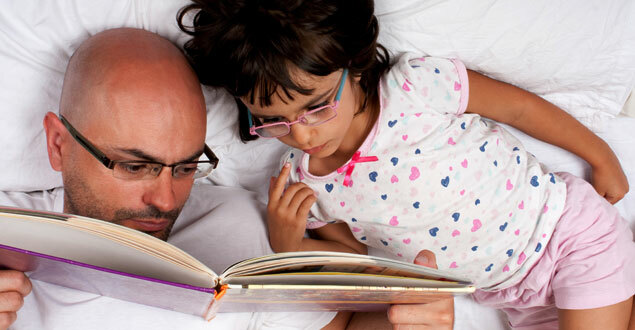 For children, reading a bedtime story before you put them to sleep is one such routine. They should know that irrespective of all the activities they did during the day, no matter how tired they feel, they ought to have a reading session before sleeping. This probably would be the start of many other routines they will develop in future. Kids are always upto some or the other mischief when they are awake – running around, exploring different objects, playing etc. And given the busy lives which most of parents have these days, they are spending less and less time with their children. Reading bedtime stories, however, is one great way to ensure that they get to spend some quality with their little ones. Children, as a lot of us would know, like to cuddle and snuggle up with their parents during these bedtime story sessions, which brings the family closer and helps create some special memories for both the parents and children. When you are reading out to your children about a laughing panda, or a Santa Claus with lots of gifts, or Where The Wild Things Are – you actually have the power to transport them to that imaginary world of books and experience those stories. By narrating the stories with a lot of drama, animated voices and special effects, you help stimulate their imagination and also develop their logical skills. Reading bedtime stories aloud to children is considered to be one of the most effective ways to develop their language skills, as it introduces them to a lot of new words. Books which are rich in language (e.g. rhyming text) can help them learn phonics and also grasp the different sounds associated with each syllable. Children learn to recognize and differentiate, both visually and phonetically, the different words they come across. This goes a long way in building a solid foundation for their lifelong language ability. The benefits of reading books are probably known to one and all. From increased focus to having better memory skills to being more educated and reformed, the list is endless. But the most important benefit of reading probably is that it makes you happier. The sheer joy one feels while and after reading a book is unmatched. And it is for a reason a lot of psychologists and psychiatrists recommend Bibliotherapy to a lot of their not-so-happy patients. In fact a recent study by Yale University on Bookworms and Life Expectancy found that people who read books live almost 2 years longer. So go ahead and read those bedtime books to your children which will set them up for a lifelong habit of reading. You are not just giving them knowledge, but also giving them a longer life. “If talking is silver then listening is gold,” goes an old Turkish proverb. Our ability to have any sort of meaningful conversation lies in our ability to listen carefully, not just to listen and reply but to listen, understand and grasp the meaning of what is being said. Especially in today’s world when everybody seems to have an opinion about everything, it is imperative for parents to inculcate this dying art of listening in their children. And reading bedtime stories provides an ideal environment, where you can keep them engaged and engrossed (depending on how interesting you can make the entire session), to help them become good listeners and also improve their attention span.